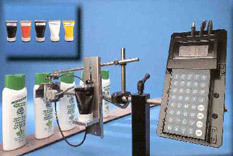 is a cost effective, high performance ink jet system for marking on any surface. The MicroMarker, made by a manufacturer with whom we affilliate, is a full featured non-contact printer that delivers both performance and reliability. This printer is designed to replace systems costing three times more. The MicroMarkerÃ‚Â’s single piece controller and solid state print head will provide years of reliable performance. 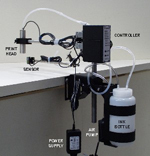 The MicroMarker handheld controller is a vast improvement over multi-component ink jet systems. All inputs to this printer are protected against static discharge. Message input and system operation is accomplished using a simple menu driven program. Most operators can be fully trained to use this system in less than 30 minutes. The MicroMarker prints using proven "drop on demand" technology. It provides for both 1/8" (9x7) and 3/32" (7x5) print heights. This solid state print head will run many ink types and formulations. The entire unit can be completely serviced or rebuilt with a single screw driver in less than 15 minutes. Ink is supplied by a single 1.5 ounce cartridge. This cartridge is all that is needed to print more than 3 million characters. With a wide variety of inks, the MicroMarker can print on a surface of almost any color or texture. Whether you choose the optional floor stand or use the more economical conveyor mount bracket, installation can take as little as two minutes. With no requirement for pressurized air, the unit can be installed and operating in a minimal amount of time.